I just realised that I've been posting nothing but dessert recipes in November. That's no good, is it? 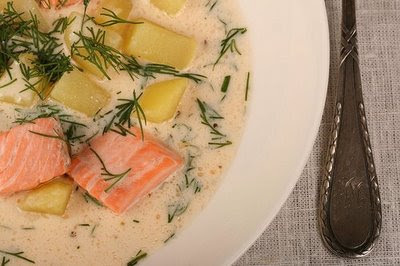 Hence this creamy-cheesy fish soup recipe today. 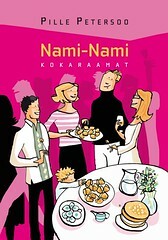 A similar recipe has appeared in several Finnish food magazines and at least one local magazine. With a few tweaks here and there, I ended up with this lovely, creamy fish soup. Feel free to experiment with differently seasoned cream cheese. I used trout, as it's lighter, but salmon would work well, too..
A lovely weeknight dinner, and it should appeal to small picky eaters, too. Bring the fish stock* to the boil. Add potato cubes and simmer, until tender (10-15 minutes). Meanwhile, cut the fish into large cubes, taking care to remove any pin-bones. Remove the saucepan from the heat, stir in the melted cheese spread and cream cheese, spoonful at the time. Put the saucepan back onto the heat, add the cubed fish. Simmer on a low heat for a couple of minutes, until the fish is cooked through. Ladle into soup bowls, sprinkle with chopped dill and grind some black pepper on top. * If using home-made fish stock, then good for you. If you're using good-quality fish bouillon cubes, then take just 1 cube for 1.5 litres of water - the fish and cheese give plenty of flavour -and saltiness - themselves and you don't want the soup to be too salty. Mmmm, I love the sound of this! Up my street! I was feeling hungry with all those healthy desserts around. whoa! adding cream cheese to the soup - genius!! What an interesting soup. It sounds great! I like to use cream cheese to thicken soup too, but I never thought to buy the flavored stuff. It would sure save prep time! I actually made this soup yesterday and it was delicious! In fact, my husband can't stop talking about it. I used cream cheese with chives, but about 1/2 the quantity you recommended (that's all I had) and added some heavy cream to make up for the rest. It was still yummy! Thanks. That looks fabulous! The fresh herbs really add a nice touch. 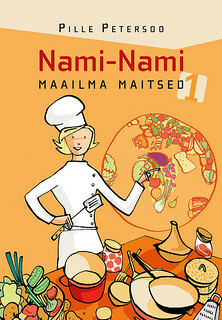 I made something similar with salmon over Christmas & again at New Year - sooooo good.